Just a little bit of history. 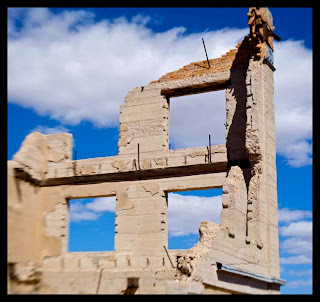 This is part of the remains of the bank in the town of Rhyolite Nevada. The best I can figure is that the town was created around 1904 and most of the town was abandoned by the 20's. their is something surreal about being in the dessert. The sun beats down on you, all you hear is the wind howling by your ears and not a whole lot of people around. It's one of the few places in the world that I can hear myself think. Don't get me wrong it can be creepy as well. For the technos out their I took this with a Canon 5d withe a LensBaby 3g. Setting were iso 100 at 1/200 and I don't remember which aperture ring I used(sorry).